When last we visited with Civilization VI, it was to play through turns 1 through 60, a.k.a. the veeeery early stages. That was a scant two months ago (not even), but last week Firaxis continued the drip-feed of information by granting us access to turns 1 through 150. Now let me marvel over Active Research for a bit. I already talked a bit about Active Research after my first Civilization VI demo, but 150 turns gives me a much better idea of how the system works. So far, I love it. First, the basics: Active Research is a new-for-Civ-VI system whereby you receive tech tree bonuses for completing certain in-game actions. Last time around I used the early-game example of founding a city on the coast, which gives you a permanent bonus to research on Sailing. Makes sense, right? You live on the shore, so your people have a natural affinity towards navigating the seas. Looking at the tech tree, it seems that every development on both the Tech Tree and the new Civics Tree (“researched” with Culture—more later) has a method by which you could boost your progression. Kill an enemy with slings and you’ll soon find yourself using bows instead. Improve two sea resources and you’ll come closer to Celestial Navigation. Earn a Great Scientist and your civilization will take a step towards Education. Chaining technologies together is a particular joy. For instance, early research on Pottery allowed me to harvest my previously-undeveloped Wheat resource. Building a farm on Wheat then boosted my research in Irrigation, and on it goes.Another example: Building an Iron Mine brings you closer to—surprise!— Iron Working. 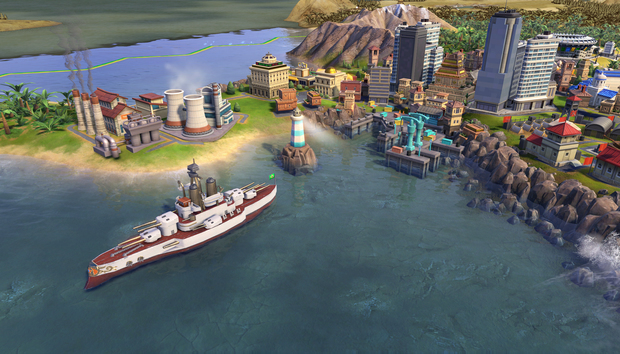 Civilization has always been a game about the progression of humanity from nomadic tribes through to the modern era, but never has the idea been so tightly encapsulated as in Civ VI. The technologies are (mostly) the same, but seeing this cause-and-effect removes one more layer of abstraction and creates a narrative from Science. There’s a logic to humanity’s development here. Do this, and that follows. Active Research also seems like smart design though, from what I’ve played. Namely, it pushes me to try things I might not otherwise—both by chance and on purpose. For instance, Theology is boosted by discovering a Natural Wonder. It may take you most of a game to discover one, and thus you might put off researching this technology until later than competing factions because it’ll waste more turns. Or, if you have a Natural Wonder nearby, you might beeline for Theology in order to get an early advantage. That’s what I mean when I say “by chance.” It’s random. It changes every game. But there are also actions I found when scouring the tech tree that I might’ve delayed or never accomplished, were it not for Active Research. Killing three Barbarians, for instance, will get you a head-start on building a more militarized government. Another tech, Feudalism, is boosted when you build three adjacent farms. Normally that might only happen by chance. Here, it’s almost a necessity. Now, whether the system holds up in the end-game? I’ve no idea. And whether players—as always seems to happen—discover the most beneficial route down the tech tree and repeat it every game again? Well, maybe. All I can say is after my Civ VI demo, I came home raring to play some more, booted up Civilization V, and then quit after fifty or so turns. It’s still a fantastic game, and I’ve no doubt some people will continue to prefer it, but the early game is so tedious by comparison. You’re not making many decisions at all, let alone important decisions. Active Research makes Civ VI feel much more...well, active. Back to the Civics Tree. This is arguably an even bigger change to Civilization VI than Active Research. Firaxis lifted a bunch of technologies out of the monolithic Tech Tree and split them into their own research pot, funded by accumulated Culture. The list covers everything from Drama and Poetry to early government forms, Guilds, and Military Training, and they’re researched parallel to your faction’s technological advancements. Thus you could technically have a civilization that’s technologically in the Renaissance but culturally still in the Ancient Era. But more realistically, the Civics Tree helps balance the relative weights of Science and Culture a bit. In previous Civs, Culture was a powerful tool that was nevertheless pretty boring and passive. You let it build and build, but rarely did the game ask you to do anything meaningful with those systems. In Civilization VI, it’s much harder to just dump Culture and go all-in on Science—especially because, thanks again to Active Research, the two trees cross-pollinate quite a bit. Technologies boost advances in Civics and vice versa. For instance, Feudalism (a civic) will give you a head start on Stirrups (a technology), which allow you to recruit Knights. And as an added bonus, there seems to be a greater total of developments to research now, split across the two trees. I actually played about 250 turns during my four hours at Firaxis—150 as Japan, then another 100 or so as Brazil’s Pedro II. A few final thoughts follow. First, the differences between factions are interesting as ever. Japan is slow to grow, but stackable bonuses for building adjacent districts (remember, cities now take up more than one tile!) are powerful later in the game. Playing as Brazil, on the other hand, I found myself loathe to build tile improvements because I actually received bonuses for undeveloped rainforest tiles. This caused me to isolate my districts on tiles surrounded by trees. Firaxis also claims Diplomacy is more interesting. It’s sort of true. Leaders now have goals that are more complex than an aggressiveness rating, like desire for specific luxury resources or (in the case of England’s Queen Victoria) a fondness for rulers who started the game on the same continent. It’s still Civilization diplomacy though. I don’t think it compares favorably to Endless Legend, let alone something like Crusader Kings. Which is to say: It’s very artificial and board game-y, though the flavor text is better this time around. And as for the military side of Civilization VI? It’s identical in broad strokes to Civilization V. One-unit-per-tile, hexes, et cetera. I killed a few barbarians, but didn’t get into a massive war yet. We’ll just have to see how things go when we get our hands on the full game in October.